The issues of poaching and wildlife trafficking can seem black and white—it’s bad news. 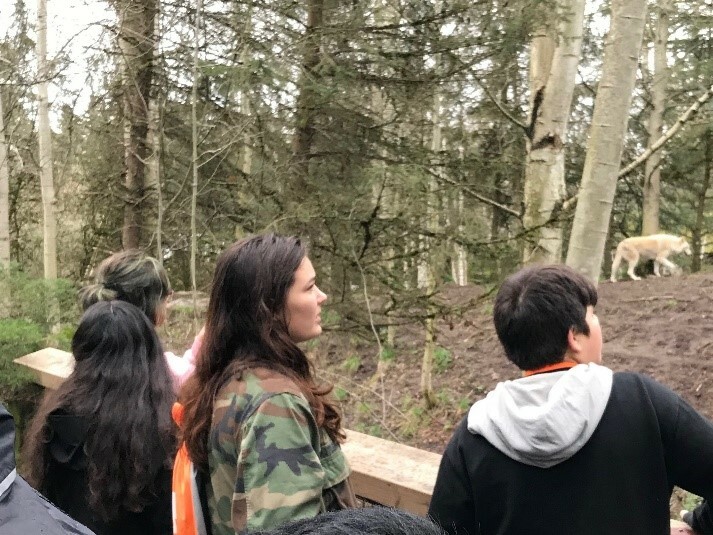 At least that was the initial sentiment of many of the middle school students who participated in this last semester’s ZooCrew, Woodland Park Zoo’s after-school program. 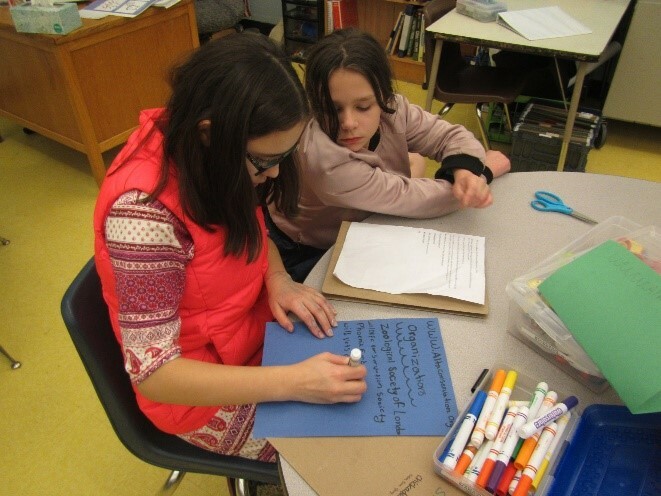 However, as the students explored the issue, they started to realize just how complex the causes and solutions can be. 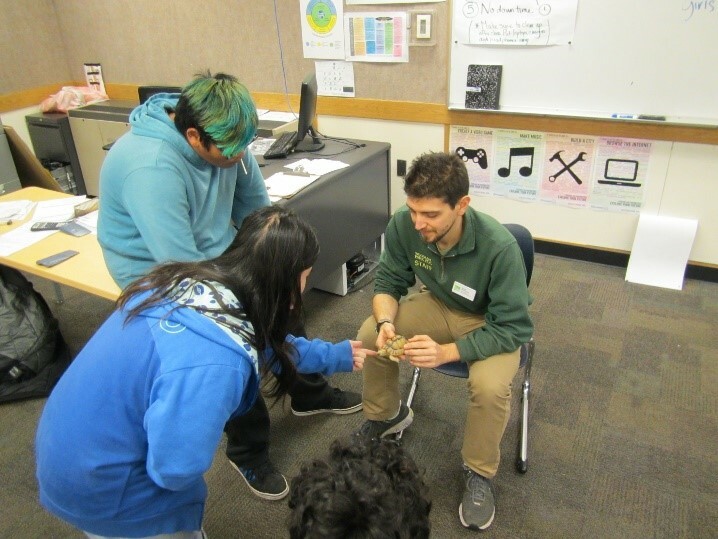 ZooCrew students greet an Egyptian tortoise. ZooCrew students spend time together making conservation props. One of the most iconic victims of poaching is rhinos. 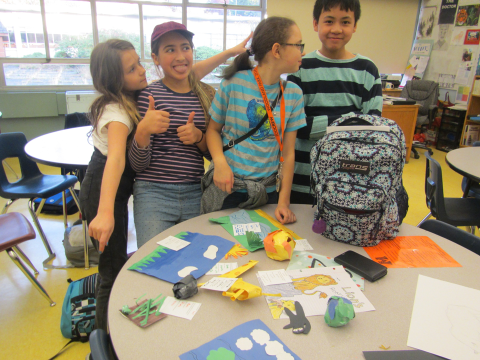 For the second year, ZooCrew partnered with the Puget Sound Area Association of Zoo Keepers (PSAAZK) to prepare projects that will be presented at Bowling for Rhinos, an annual fundraiser for the LewaWildlife Conservancy in Kenya. 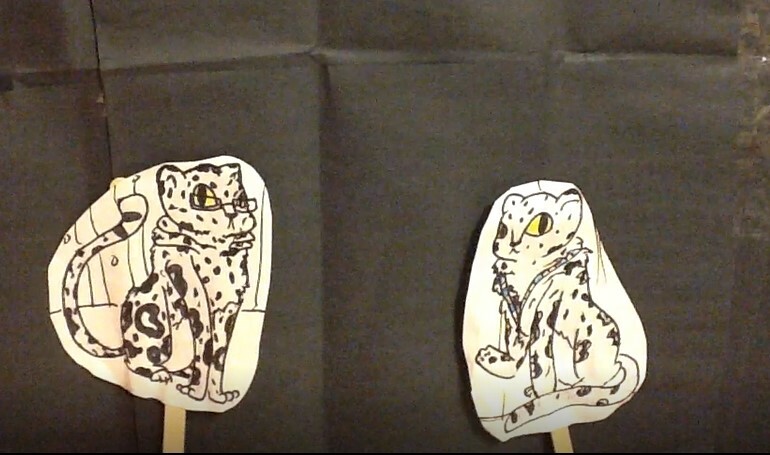 Some groups chose to make videos to inform guests at the event about the threats rhinos face and ways they can help protect them. 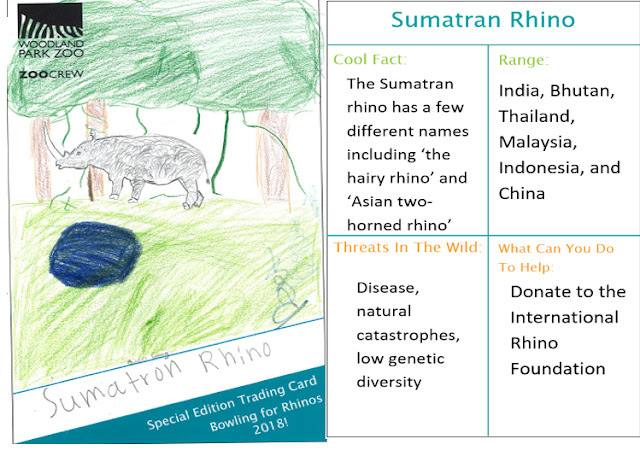 Other groups aimed to share similar information in the form of trading cards. Students and their projects will attend the Bowling for Rhinos event on May 5th to educate participants as well as enjoy a night of bowling, taco bars, and raising money and awareness for rhino conservation. 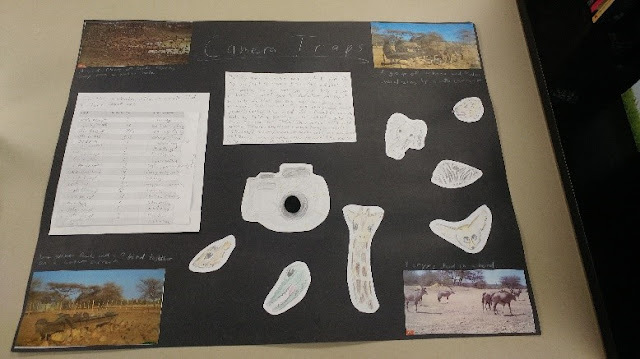 Four groups used their creativity to find new solutions for wildlife trafficking and poaching. 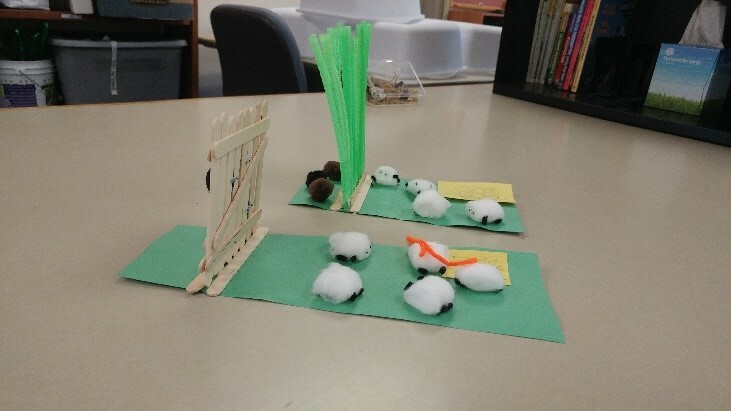 One group explored ways to keep predators and livestock separated to reduce retaliatory killing in ranching areas by creating living bamboo fences. Another group looked at the illegal pet trade and how it impacts animals like servals—advocating for domestic cat species that have similar appearances but aren’t wild animals. Two more groups discovered alternatives to poached products—focusing on the use of tagua nuts as a replacement for ivory soap carvings. Another looked at a variety of alternative products including synthetic furs, skulls and possible replacements for traditional medicines made from endangered species. ZooCrew students present their ideas to zoo staff and volunteers. Those sheep are safe thanks to bamboo barriers, great idea! Camera traps are necessary tools for conservationists to study animals in the field, but they can often lead to large caches of photos that need to be sorted. In some cases, researchers have turned to the public for help. Two groups assisted with a back-log of images by sorting through hundreds of photos from various projects in Africa and coding them based on the animals they contained. Not only did they learn how to tell a wildebeest from a gazelle, but they helped create a database that scientists will use to determine the population size and distribution of various species on the savanna. The ZooCrew students encourage you to head to www.zooniverse.org and find a project to help with! 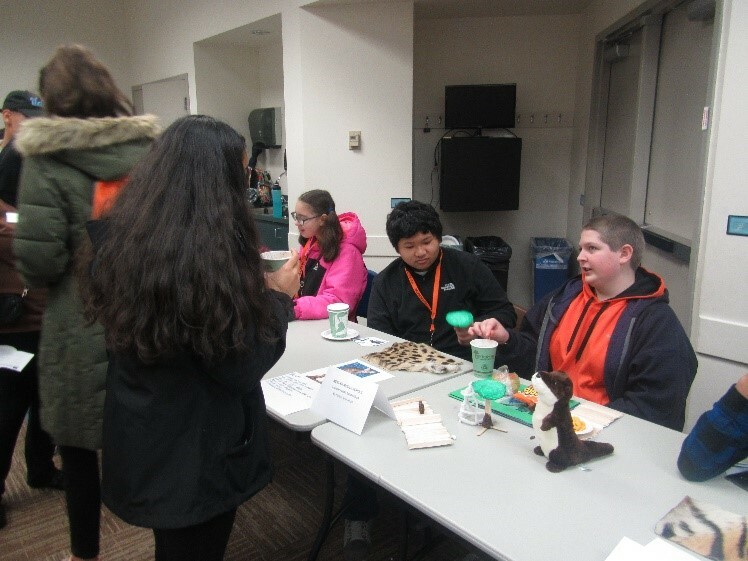 Two groups aimed their projects at a broader audience with the intent of informing people about why poaching is a problem and what they can do to help. One group focused on poaching here in Washington state and highlighted actions like reporting suspected poaching to the Washington Department of Fish and Wildlife. The other group focused on the Amur leopard and researched organizations that help not only the leopards but local communities. ZooCrew doesn’t just happen in schools and the zoo. 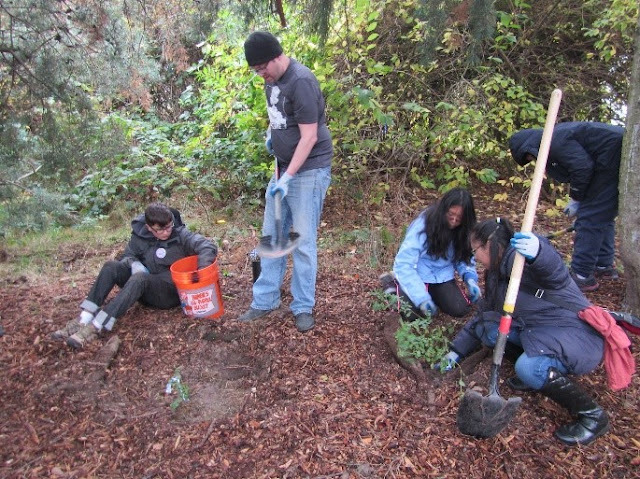 Each semester, we aim to get out into the community to help improve the green spaces around the students’ homes. 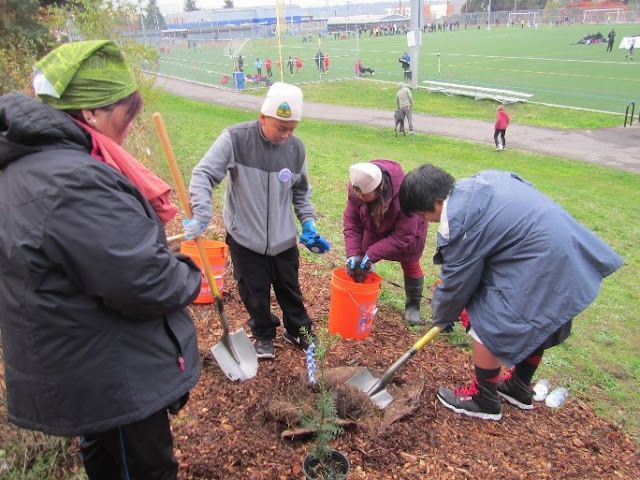 In October, we participated in Green SeattleDay and helped to plant trees in Jefferson Park—right next to one of our school sites! Together with other community members, we helped plant over 100 native trees and shrubs at our work location. In November, we braved the rain to help remove invasive ivy from Lincoln Park in conjuncture with Friends of Lincoln Park. A special thank you to the family members that came out to help make our green spaces a better place for animals and people! At the end of each semester, students and their families from all three sites come together at the zoo. They started the day being toured around by some amazing teens from the ZooCorps program. 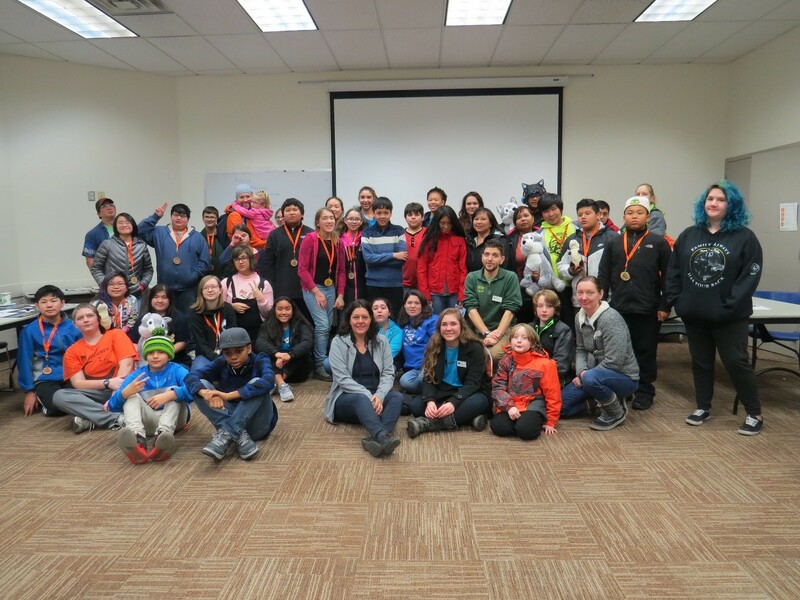 This was followed by our customary pizza lunch and a wonderful presentation by Sarah Werner, the zoo’s Senior Interpretive Content Developer. Sarah discussed the design process her team goes through when working on the signs and interpretive elements around the zoo. She also gave us a sneak peak of the new Assam Rhino Reserve exhibit space coming this spring! 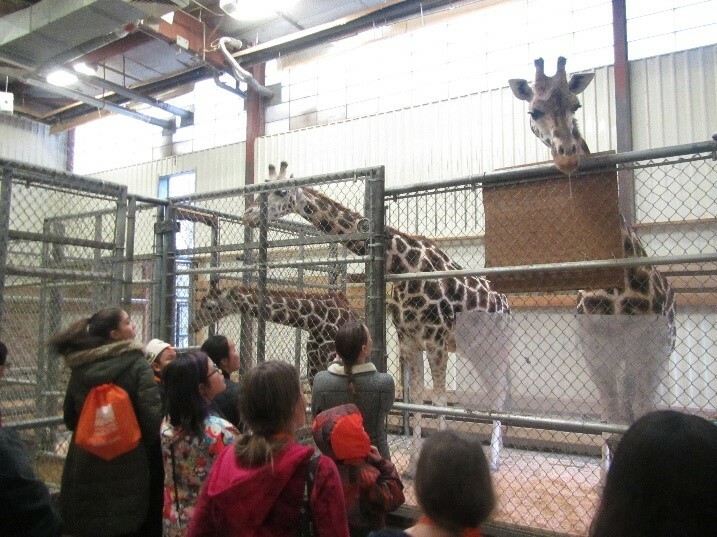 Groups then headed off to special keeper talks at the Tropical Rain Forest dome and the giraffe barn. Finally, they presented their projects to a group of staff and volunteers. Giraffes check out the ZooCrew team. As the fall program wraps up, we wanted to extend a giant THANK YOU to our community partners, ZooCorps volunteers, and the zoo staff who help make this program possible. We also wanted to thank the parents and guardians who make so many of these opportunities possible for their students. We look forward to our spring semester where we will delve into climate change action and the ecosystems of the tundra, taiga, and temperate forest! How would you like to lend a helping hand to frogs, toads and salamanders in our backyard? You can by becoming a volunteer citizen scientist to monitor our ponds and wetlands! 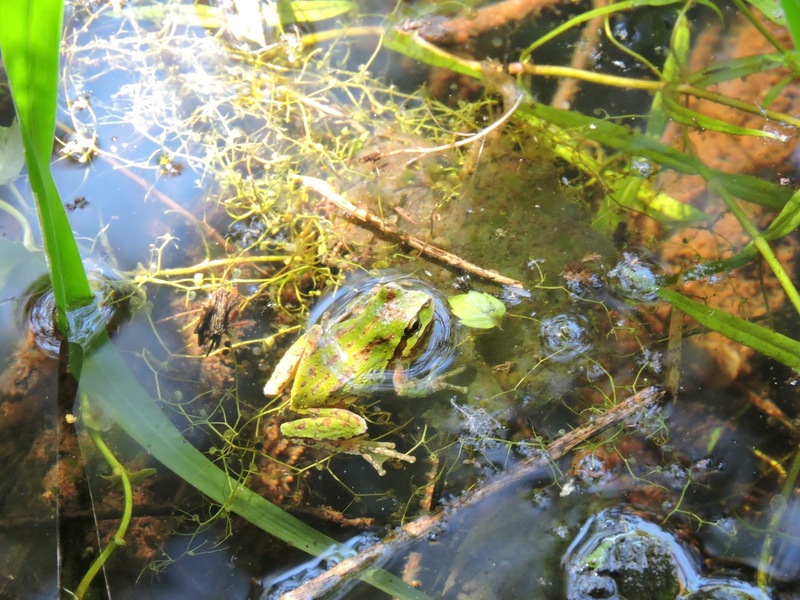 Pacific treefrog spotted at Forterra's Hazel Wolf Wetland. Photo: Mike Mallitt. Over a six-month period, citizen science volunteers will monitor eight different species of frogs, toads, and salamanders in wetlands throughout western Washington, which may include Mercer Slough Nature Park, parks in Seattle and King County and, potentially, Snohomish County Public Works sites. Volunteers are required to participate in a classroom and field training session on February 10 or February 17. Teens between ages 14 and 18 are welcome and encouraged to join a monitoring team with at least one other teen participant. Sign up for a training session at www.zoo.org/amphibianmonitoring. We will team up with Washington Department of Fish and Wildlife to conduct the field training. Participants are equipped with hip waders, GPS units, aquascopes, and other monitoring tools as they learn how to identify and document egg masses of different amphibian species in a way that’s safe for people, wildlife and habitats. 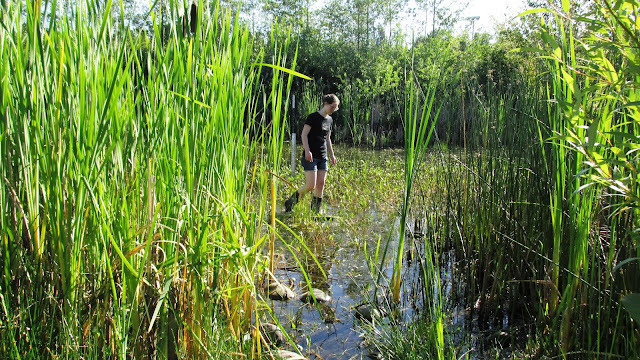 Once trained, volunteers will form teams and choose a wetland or pond to monitor on a monthly basis—recording data and taking photos of any amphibians they encounter. 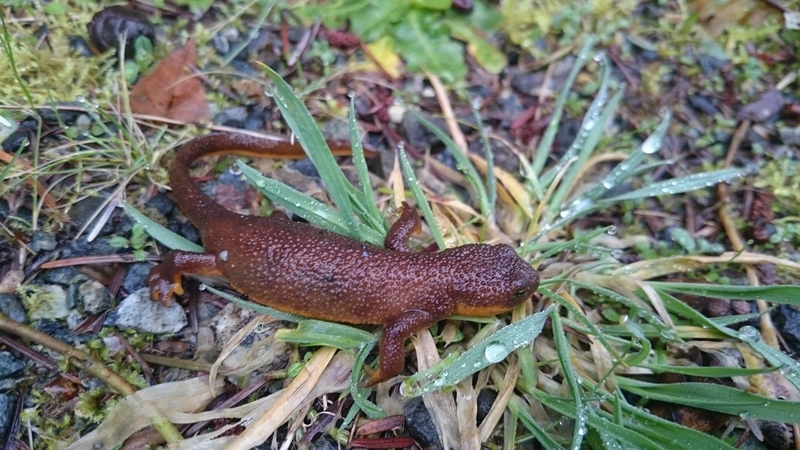 The Citizen Science Amphibian Monitoring program is offered through Woodland Park Zoo’s Living Northwest program, in partnership with Northwest Trek Wildlife Park, Point Defiance Zoo & Aquarium, and Washington Department of Fish and Wildlife. Launched in 2012, the program provides much-needed data on amphibian populations for Washington Department of Fish and Wildlife. The volunteer scientists gain knowledge of and appreciation for amphibians and their wetland habitats, and the skills to do relevant, hands-on scientific data collection. The ancient class of amphibians includes salamanders, newts, an obscure group of legless creatures known as caecilians and, of course, the icons, frogs and toads. To sign up for a training session, go to www.zoo.org/amphibianmonitoring. Goldie stood to the right upon entering Floyd’s sitting room. He had a place of honor right behind a sofa on a small platform by the window. 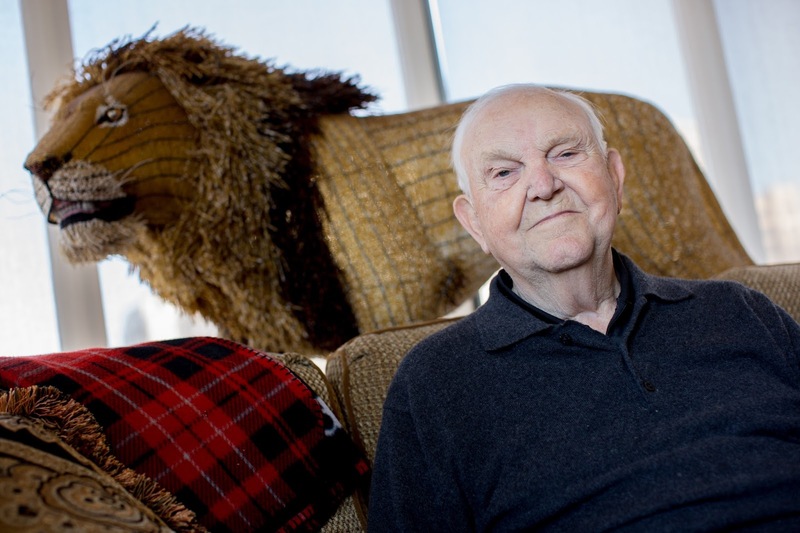 Goldie the lion sculpture was purchased on a trip to South Africa Floyd took with his companion, Alene Moris, a number of years ago. The purchase was a quick decision, something for which Floyd was well known, on a side trip during a delay en route to the airport. Floyd was taken with the beauty of the lion, a piece of incredible artwork composed of thousands of tiny gold beads in intricate handiwork. Goldie served as a reminder of the safari they took and the extraordinary memories of seeing lions in their wild habitat. 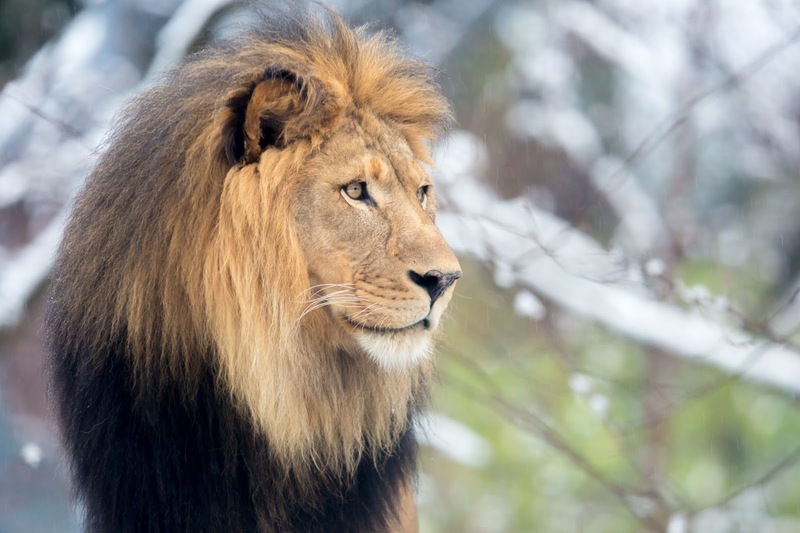 Floyd was keenly aware that most people will not have the chance to see the majestic, awe-inspiring lions in Africa as he did, and wanted them to be able to see them up close at the zoo. “I didn’t get the chance to go to the zoo as a child, so I want to make it possible for as many children as I can to be able to go”. As a child in Missouri in the 1920s and 30s working in the cotton fields as the son of a sharecropper, making learning a priority was not easy. Floyd credited a number of people in his life who encouraged him to pursue his education. Floyd’s mother was an immense influence in this area, inspiring him not to give up. A special teacher in high school was also a keen motivator for Floyd. She made it her mission to teach the children from his rural community about the arts and literature. Even though this was not something many of his peers could utilize at the time, she was convinced that all children, no matter what their circumstance, should be exposed to all types of books and poetry. In many different ways, this made a lasting impact on Floyd. Upon moving to Seattle in 1953, Floyd and Delores lived right across the street from Woodland Park Zoo, where they were residents of the Phinney Ridge Apartments. “We’d hear the animals making all kinds of noises, they were our next door neighbors” he remembered. Floyd worked at the Boeing Company as a returning serviceman in the evenings and studied at the University of Washington during the day while Delores worked as a social worker. Balancing full-time work and school was very demanding for Floyd and Delores one day suggested to him that he quit his job and focus solely on his studies while they lived on her earnings. “This was the greatest gift she could have ever given me,” Floyd said. “Immediately, I was able to focus more and my grades went up!” Floyd went on to become extremely successful in the financial management field, landing his first post-college job at the Tacoma office of Dean Witter & Co.
As our recent visit was coming to an end, I had one last question for Floyd. What does philanthropy mean to you today? Without missing a beat and with a tear in his eye, “philanthropy is sweetness for the soul,” Floyd said. I couldn’t agree with you more and by the way, we all think you were a pretty sweet guy yourself, Floyd. On behalf of the 1,200 animals and millions of children who will benefit from your kindness, it’s our great honor to help bear your legacy. In case you missed our keeper spotlight on Instagram (@woodlandparkzoo) last week, here’s an inside look at what it’s like to work with snakes, lizards and turtles as part of Woodland Park Zoo’s reptile and amphibian team. Hey everyone, we'd like to introduce you to Alyssa Borek, lead keeper on our reptile and amphibian team. Alyssa is a herpetologist—an expert in caring for our turtles, snakes, frogs and lizards. 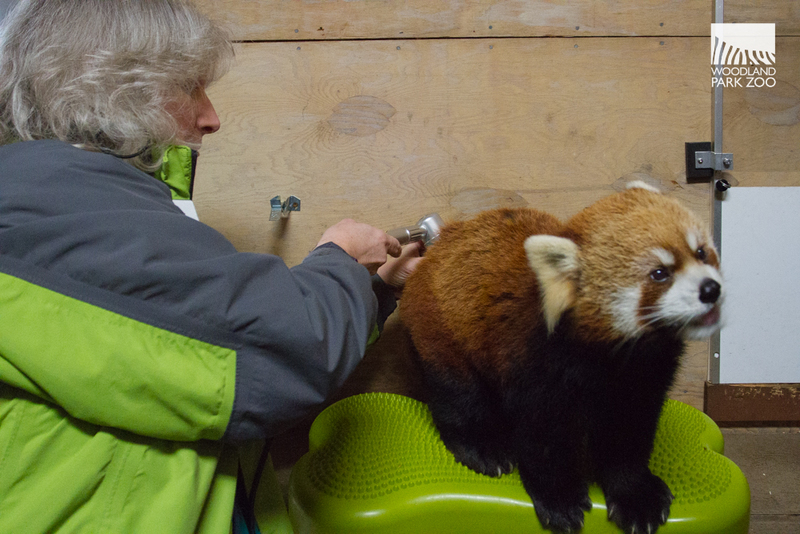 We're going to hand you over to Alyssa today for an up-close look at what it takes to care for these amazing creatures. Enjoy! Alyssa Borek with a flowerbox turtle. Photo by Peter Miller. Hi everyone, thanks for following me along today as I show you a few really cool parts of being a zookeeper and working with herps. In this photo, I am holding one of my favorite turtles here at Woodland Park Zoo! This is one of our female flowerback box turtles, or as I refer to them, Cuora galbinifrons. These turtles are Asian box turtles from China, Vietnam, and Laos and are Critically Endangered in the wild. 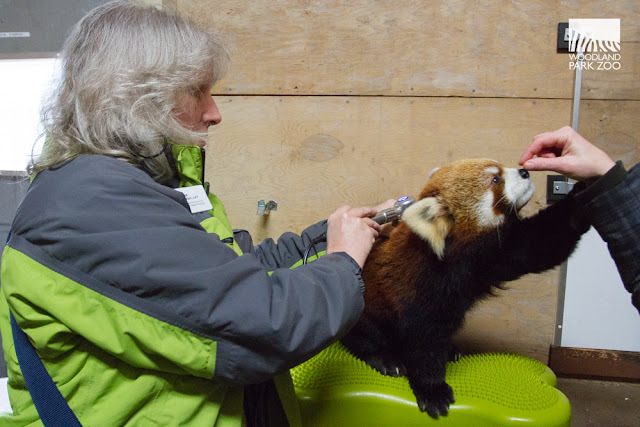 Woodland Park Zoo animal keepers have figured out the perfect balance of science, pixie dust and magic to get them to successfully breed. We currently have five juveniles of this species ranging in age from 1 ½ to 2 ½ years old. Thanks for all the fish! Burmese vine snakes hang loose. These Burmese vine snakes, Ahaetulla fronticincta, are a long time favorite of both visitors and keepers. 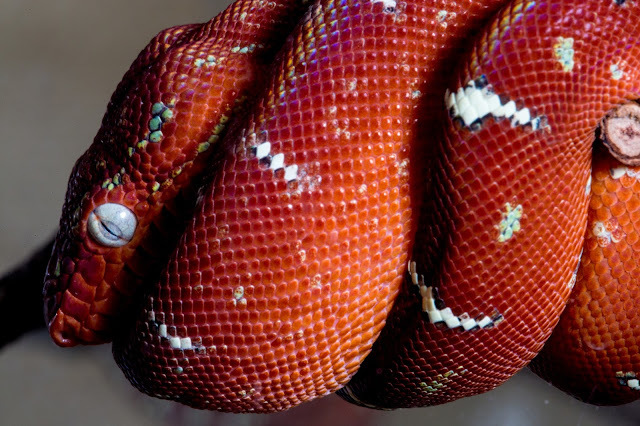 These beautiful snakes are piscivorous, only feeding on live fish. Many visitors enjoy watching carefully to see if they can see them hunting in action. These snakes are now housed off exhibit, but I still enjoy offering them food and watching them hunt. These snakes send a shout-out to our commissary staff who keep them in steady supply of just-the-right-sized fish. Black breasted leaf turtle gets its snack on. Yummy breakfast! This small turtle is a fully-grown black breasted leaf turtle, Geoemyda spengleri, enjoying a well-balanced breakfast of salad, fruit, cat food and bugs. Since we are not always able to replicate an animal’s diet exactly as it would be in the wild, we work with a nutritionist to come up with a personalized diet that has all the nutrients that they would be getting in the wild with ingredients we have available to us. Often, I think our reptiles eat a better diet than I do...I would not be too keen to eat the bug part of their diet, but the rest of it is always fresh and looks delicious, and the animals seem to agree! Asian brown tortoises are some of the largest in our collection. Asian brown tortoises, Manouria emys, are the largest tortoise species in Woodland Park Zoo's collection (4th largest in the world! ), with the male (in foreground) weighing in at over 30 lbs! These majestic tortoises are from an ancient lineage, perhaps the oldest species of tortoise that currently exists. The females will create a mound nest with leaf litter and vegetation to lay their eggs then actively defend it from predators—the only tortoise species to exhibit this behavior! Look for these amazing tortoises to debut in a new exhibit, Assam Rhino Reserve, in the summer of 2018! Up close with a Denny's tree frog. Say hello to this Denny’s tree frog! 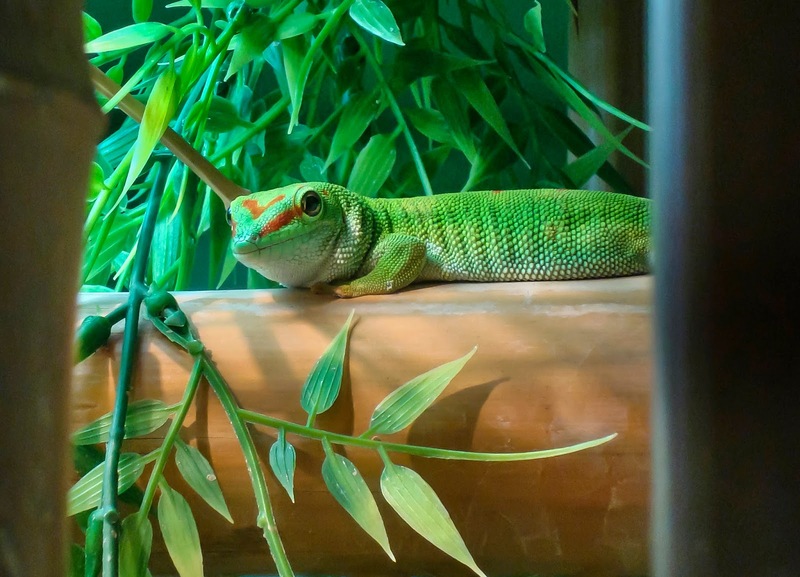 Reptiles are ectothermic, or cold-blooded, meaning they rely on their environment to regulate their body temperature. 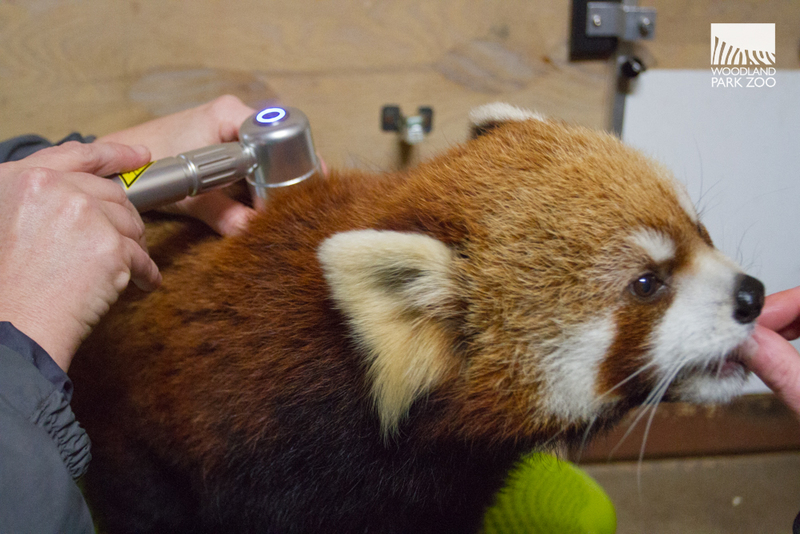 As part of my job, I closely monitor temperatures in the environments of all the animals I work with. 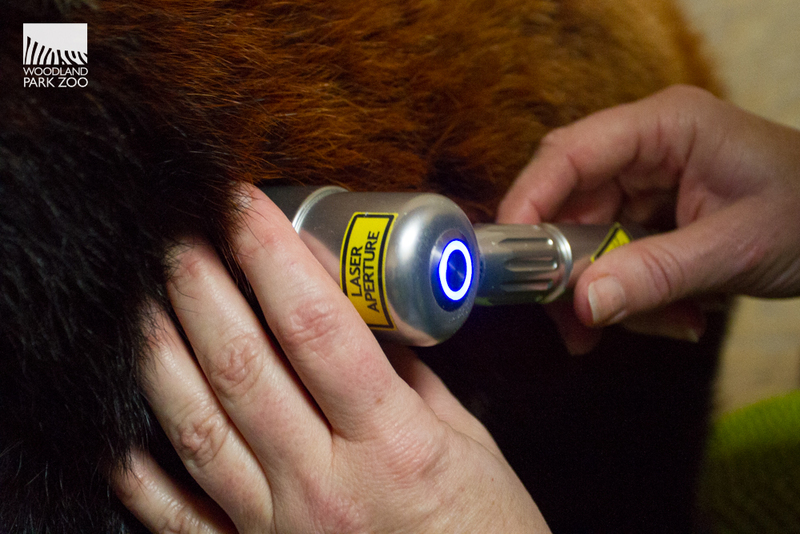 One of the tools I use is a temperature gun that has a laser sight on it. While taking routine temperatures of this little lizard's habitat, he was very interested in the laser dot and followed it around. Don't worry, he got some tasty crickets after I filmed this video! This is a juvenile shield-tailed agama from North East Africa and one of the ways I can tell he is a boy is because he has a splash of blue coloring visible on the side of his jaw and under his throat. A lot of reptiles and amphibians are threatened by human-associated activities, so I would ask everyone to help conserve the planet to help them. If we all do a little, it will help a lot. Reduce, reuse, recycle, compost, turn off lights when you leave the room, don’t leave water running, use the cold water setting on your washing machine, pick up trash if you see it outside, run the dishwasher only when you have a full load, etc. If you see reptiles or amphibians in the wild, enjoy their splendor, but leave them where they are. Take a photograph so you will always remember your encounter and they will remain there for others, including future generations, to enjoy. This orange beauty is a juvenile emerald tree boa. This species is named after the adult boas, as they turn green as they get older. Photo courtesy of Alyssa as a kid, still loves snakes just as much! Working with animals is a life-long passion of mine! This is certainly a challenging career, but the sacrifices have always been worth it! For those of you looking to be a zookeeper, I recommend trying to do your best in school and at minimum get a four-year degree. Try to volunteer as much as possible with different zoos, aquariums, nature centers, etc., and be prepared to have several internships and/or part time jobs before landing a full time zookeeping job. You will be rewarded with the opportunity to work with some amazing animals and contribute to saving animals from extinction. Here is a throwback to me as a kid, still just as fascinated by animals now as I was then! Selat enjoying a Valentine treat. Komodo dragon love! As a zookeeper, I am always trying to enrich the lives of the animals in my care and make their lives as dynamic as possible. Depending on the species, there are a lot of different types of enrichment that can be provided. Sometimes, I will add a sprig of fresh herbs to an enclosure, giving the animals a chance to smell (and possible eat) something novel. Other times, I will add a pile of leaves from zoo grounds to their enclosure, giving them something to dig through and probably some tasty bugs to munch on. 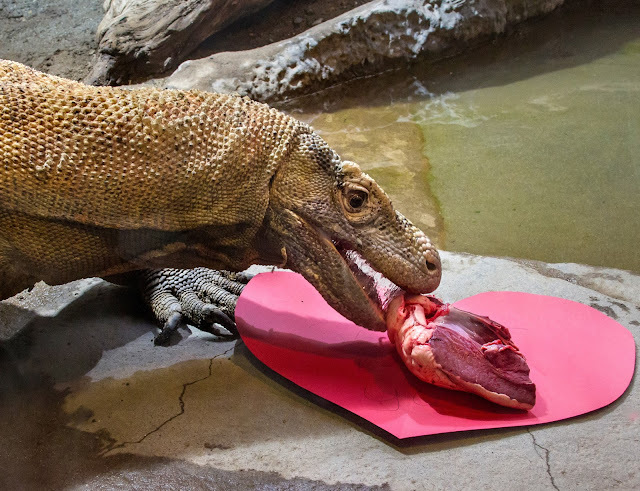 For some of the holiday-themed weekends at the zoo, I will prepare a special tasty treat… like this Valentine’s steak for our beautiful Komodo dragon, Selat! King cobra in a snake tube so veterinary staff can take a blood draw, safely. Photo by Kimberly Dawson. Safety first! For the venomous snakes in our collection, we have strict safety protocols to follow to make sure the keepers and staff are always safe. When handling these snakes, we always use tools that keep us out of “strike distance.” Some of these tools are hooks, or tongs, or as seen in this photo a restraint tube. By running the snake into a clear tube, we are able to safely restrain him while the veterinary staff perform an exam on this king cobra, Ophiophagus hannah. In addition to a physical exam, they were able to obtain radiographs and a blood sample on this snake. Well that's it for today, I hope you learned a little more about the amazing reptiles and amphibians we have here at Woodland Park Zoo. It was great to share my day with you all. Thank you for following along and if you see me at Woodland Park Zoo be sure to say hello! Editors note: Last year, a fire damaged the Day and Night Exhibit building. Since the fire, most of the animals have lived in temporary housing in several off-exhibit locations around the zoo. Several species have even bred and produced offspring. It's been hard work to care for these animals in different locations around the zoo, but we have lots of great keepers dedicated to making sure all of their needs are met. 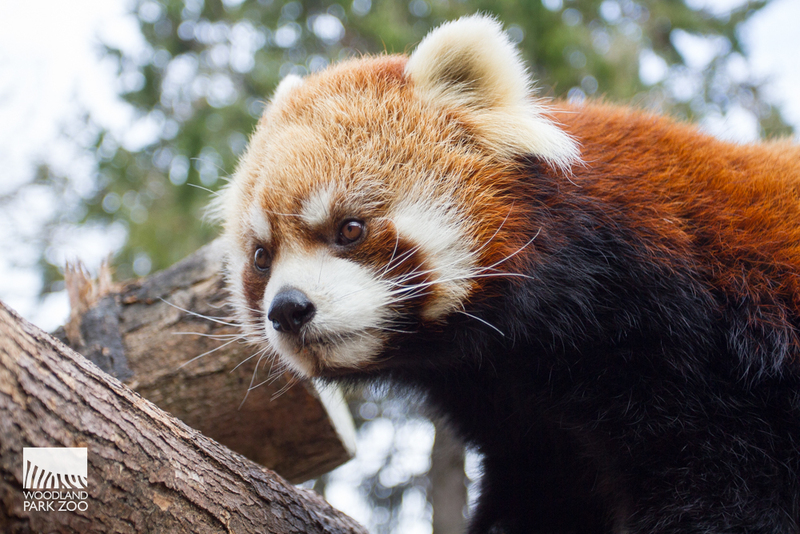 The zoo is still working through insurance to decide on the next best steps to take. We will keep you posted as soon as we have any updates. As a very auspicious start to 2018, we are excited to announce the birth of twin sloth bear cubs. The tiny cubs were born December 27, 2017, in an off-view maternity den. The first cub made its appearance around 3:20 a.m., while the second cub took its time—appearing almost 11 hours later. Animal management has been diligently watching and listening to the twins and mom since the birth—keepers can tell a lot from the noises the cubs make, like whether or not they are nursing etc. So far they say the little family is doing great. Tasha and cubs through the den cam. The twin cublets are highlighted here in the circle above. Mom, 13-year-old Tasha, is showing all the signs of being a protective and attentive mother. She has experience after all, having successfully raised two cubs in 2012. Bhutan, the 17-year-old father, is hanging out away from mom and cubs to give them plenty of quiet time. Tasha and cubs will remain off view to allow for peaceful family time. This time is critical for maternal bonding and undisturbed nursing. Animal care staff is monitoring the new family via a live web cam to ensure the cubs continue to thrive. Right now we can expect a lot of napping and keeping cozy on mom's warm fur. Tasha with cubs in 2012. Animal care staff will continue to monitor the cubs’ progress on the den cam and will perform a routine wellness and development check on the cubs if Tasha begins to temporarily shift in and out of the maternity den. Sloth bears are born extremely small and blind at birth. They open their eyes at between 3 to 4 weeks old and can walk shortly after their eyes open. 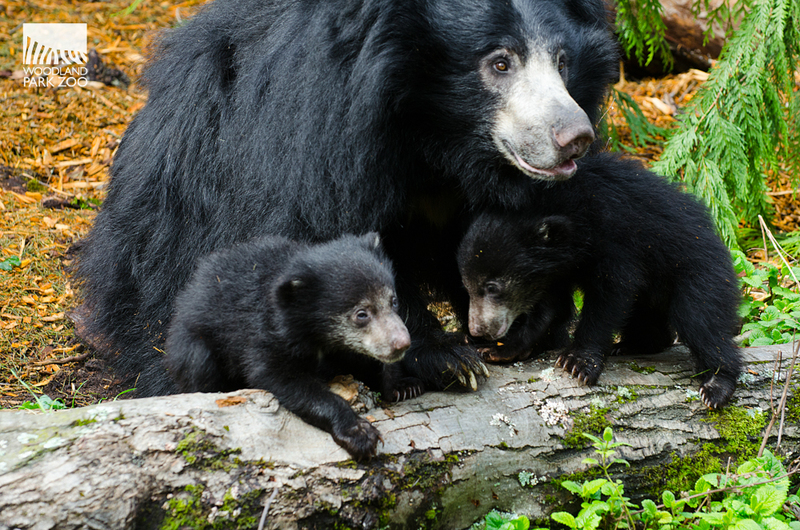 Unlike other bear species, sloth bear mothers carry cubs on their back when cubs reach about 2 months. If all goes well, weather included, Tasha and her cubs could be on exhibit sometime in March. Tasha hanging in Banyan Wilds. 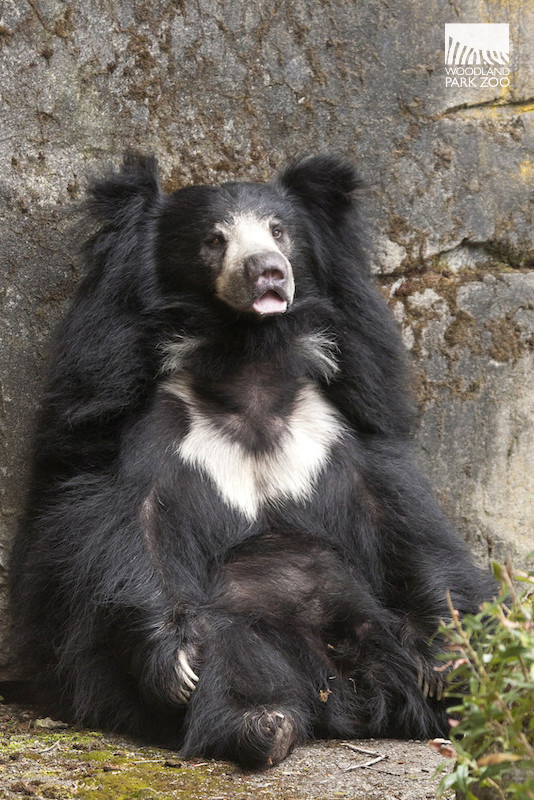 Sloth bears are found in the lower elevations of Bangladesh, Bhutan, India, Nepal and Sri Lanka. They are an endangered species, less than 10,000 remain in the wild. 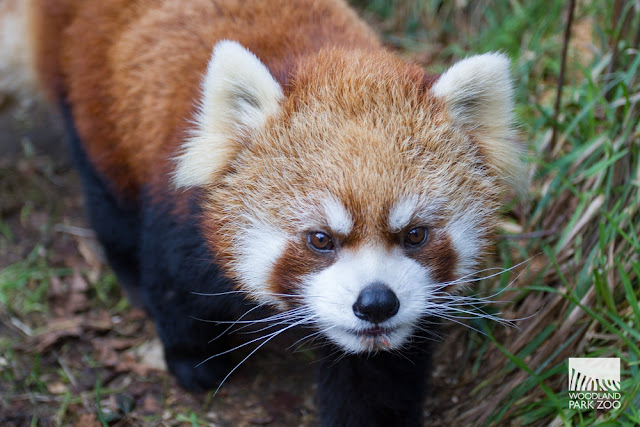 Their survival is challenged by fragmented populations, competition with other animals (particularly humans) for space and food, deforestation, and the bear parts trade for use in traditional Asian medicines. Woodland Park Zoo is a participant in the sloth bear Species Survival Plan (SSP), a cooperative breeding program under the Association of Zoos & Aquariums (AZA) that ensures genetic diversity and demographic stability among North American zoos. 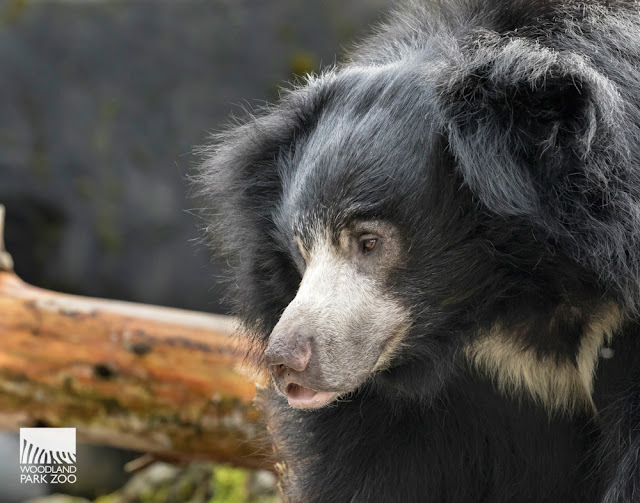 In addition, the zoo funds Wildlife SOS and their sloth bear research through the Wildlife Survival Fund. For updates on the 2018 twinsies, check back right here and we'll keep you posted on their development milestones and any information on when you might be able to visit the cubs.